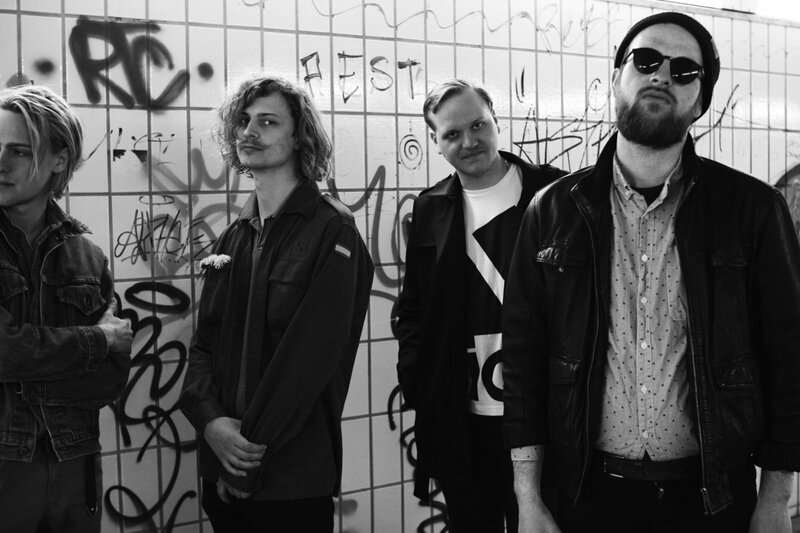 Skin are an indie rock band based in Flensburg, Germany. After an extended period of writing and performing since their formation in 2015, they decided to take the plunge and make their inaugural mark on the local music scene by recording and releasing their debut EP in mid-2018. The resulting product, ‘Shave My Eyelashes’, showcases a confident and unique band that have a clear direction and a huge amount of potential. (currently Lennart Krasa), who excellently tailors his drum part to the requirements of the song. His use of ghost notes is brilliant and effectively cooperates with the distorted bass, whilst he chooses to drop out completely in the more ambient verses to allow the arrangement to breathe. This shows he’s clearly kept the arrangement at the forefront of his mind when writing his part and displays excellent attention to detail. ‘Unisex Showers’ has a much more modern pop sound and features some fantastic ambient guitar work. Interestingly, whilst the instrumentation is once again very distant and ambient, singer Leon Kraack’s vocal track is much dryer. This is incredibly effective as it not only allows the vocal track to sit comfortably in the mix, but also allows the lyrics to be much more audible. The verses in this track are accompanied by a rolling tom beat and interesting section of chants, giving the verses a curious and optimistic vibe about them. This is drastically contrasted by the chorus, which features rumbling bass, ambient synths and drum pads. I thought this excellently tied in with the somewhat naive and coming-of-age nature of the lyrical content. At this point, my attention turns to how the band’s material would best work in a live setting; as their recorded material relies heavily on drum pads and other synth sounds, it’s worth giving thought to how they’d best like to incorporate this aspect of their sound into their live performances. Whist recruiting a keys player is a viable option, I’d strongly suggest the band look into making use of backing tracks during their live shows. Backing tracks are also beneficial in keeping an ensemble in time and add a whole new dimension to a band’s sound. ‘I’m Still Here’ showcases a slightly different aspect of the band’s sound, with influences of rap, pop and chillout. Particular praise goes to bassist Max Schumacher for a wonderfully melodic bass track. His part is incredibly catchy and provides a solid foundation for the picked guitar lines, ambient backing vocals and lead rap line. Whilst this track is very different from the rest of the material on the EP, it retains many of their signature traits; these include ambient vocal parts, strong contrasts between the verses and choruses and pounding drum beats. The track also shows the band are adaptable and have a range of options in crafting their sonic identity. I’m looking forward to seeing how the band choose to further refine their genre and signature traits over their next few releases in order to craft a well-channeled and thoroughly-focused sonic identity. At this point, I notice that all of the tracks on this EP are over four minutes long and feature extended instrumental sections. Whilst this works fantastically on the EP and showcases the extent of the band’s abilities, they may struggle to promote tracks of this length on radio and streaming services. As a result, I’d strongly recommend the band look into producing a set of radio edits in order to best promote their material on social media, streaming services and radio. The EP rounds off with a return to the band’s more typical sound with the balladesque ‘Ryanair’. This track features some fantastic rhythm guitar work; one part gently carries the main arrangement, whilst a second provides ambient, reverberated sustained chords. Whilst the track initially presents itself as a laid-back conclusion to the EP, we’re unexpectedly launched into a huge coda section complete with pounding drums and warping guitar feedback. I felt this perfectly encapsulated the very best of the band’s signature traits and ultimately left me wanting to hear more. Lastly, my attention turns to the EP’s production, which is overall very good. All instruments are very well recorded and it’s clear the band have taken adequate time to source appropriate tones and takes at the source. The mixing and mastering is also brilliant, effectively adhering to the band’s ambient sound and providing a consistent feel across the entire EP. Overall, ‘Shave My Eyelashes’ is an incredibly promising debut release from a talented, ambitious and interesting band. They’re well on track to carving out a very solid sonic identity and have a fantastic set of signature traits. It’s no doubt they take their craft very seriously and I’m thoroughly looking forward to hearing what they release next. Highly recommended for any fans of rock, alternative or ambient.